Mohamed Aboutrika of Al Ahly and Egypt has been crowned the 2008 BBC African Footballer of the Year. The midfield star won by an overwhelming majority - taking more than half of the total ballot. More than 155,000 people cast their votes for the BBC award - the only one of its kind to be decided by football fans around the world. Aboutrika beat the 2007 winner Emmanuel Adebayor, Didier Drogba, Samuel Eto'o and Amr Zaki to the title. The award is recognition for a magnificent year for the player, in which he helped his country to win the Africa Cup of Nations and his club to take the African Champions League for a record sixth time. "2008 was a tremendous year," Aboutrika told the BBC's African sports programme Fast Track. "It was an opportunity for me and my team-mates to be a showcase for Egyptian football, across the world." Aboutrika scored the winning goal for Egypt in the Pharaohs' triumph at the Nations Cup in Ghana. He also set up several goals in the final of the Champions League, as Al Ahly claimed the continental title yet again. "This prize is a wonderful present for me," Aboutrika said. "It's an honour both for Egyptian football and for my club Al Ahly - I am very happy to be this year's winner of the BBC African Footballer of the Year award." 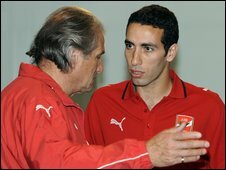 His coach at Al Ahly, Manuel Jose, said Mohamed Aboutrika richly deserved his award. "Aboutrika is the key player," he said. "What the other players can't do, he can do. He is fantastic player and a fantastic person. "I agree with this award because for me he is the best player playing in Africa for the last five years, every year he is the best." Aboutrika is the second Egyptian to win the award - after his club and international colleague Mohamed Barakat, who won in 2005.